Social unrest, injustice and the popular movements they spark often make their way into the theology of various religions — eventually. This is true of #BlackLivesMatter, which started as a social protest movement in the wake of the shooting death of Trayvon Martin in 2012 and has grown to encompass the unrest, anger and desire for change in the wake of successive police killings of unarmed black men: Freddie Gray, Michael Brown, Eric Garner, Tamir Rice, Walter Scott and many more less-well-known individuals. Now, #BlackLivesMatter ideology — that black lives are devalued by a broader, unjust society — is making its way into churches, synagogues, temples and other places of worship, just as the ideology of the civil rights movement did in the 1960s. This edition of ReligionLink looks at where and how #BlackLivesMatter is becoming a theology as well as a movement. Eric Garner, Staten Island, N.Y. (July 17, 2014) — The New York Times maintains a timeline of Garner’s death, reactions to it and legal issues. Michael Brown, Ferguson, Mo. (Aug. 9, 2014) — The St. Louis Post-Dispatch maintains an online special section about the shooting and related events. Tamir Rice, Cleveland, Ohio (Nov. 22, 2014) — The Plain Dealer in Cleveland has extensive coverage of the death of Rice, a 12-year-old boy with a toy gun. The original story can be read here. Walter Scott, West Charleston, S.C. (April 4, 2015) — The Post and Courier has run numerous stories on the death of Walter Scott, including this one taking apart the 2.7 seconds that ended Scott’s life. Freddie Gray, Baltimore, Md. (April 19, 2015) — The Baltimore Sun maintains an online section about Gray’s death. In Florida, a group of clergy started a #UseMeInstead campaign to protest the North Miami Beach Police Department’s using mug shots of black men for target practice. In December 2014, the African Methodist Episcopal Church, the African Methodist Episcopal Zion Church and the Church of God in Christ — three of the largest African-American Protestant denominations — held “Black Lives Matter Sunday,” a day of prayer among their thousands of congregations worldwide. Odyssey Networks, a nonprofit project of the National Interfaith Cable Coalition, posted a series of “preaching reflections” by pastors around the U.S. in the wake of the shooting of Michael Brown. Read “Black Activism, Unchurched,” part of a series on young people and religion by Emma Green for The Atlantic, March 22, 2016. Read “We Cry Out for Justice,” a blog post by religion scholar and self-proclaimed “Baptist-Buddhist” Jan Willis about what Buddhism has to say to the Black Lives Matter movement. Read “And the Young Ones Shall Lead Them: The Ferguson Rebellion and the Crisis in Black Leadership” by Cornel West and the Rev. Osagyefo Sekou, published in Ebony’s October 2014 issue. Watch “State of the Black Church: #BlackLivesMatter,” a panel organized by the National Urban League and posted on YouTube. Watch “Faith & Ferguson in the 21st Century,” a panel convened on April 25, 2015 by the Smithsonian’s National Museum of African American History and Culture and live-streamed on their website. Read “How a New York Seminary Became a Hub for Eric Garner Protests” by Jack Jenkins writing for Think Progress, Dec. 7, 2014. Read “An Open Letter to Presidents and Deans of Theological Schools in the United States,” written on Jan. 15, 2015, by African-American presidents and deans of U.S. theological schools that, among other things, calls on churches and other houses of worship to work for justice in the wake of multiple crimes, including violence against young African-American men. Read “On if black lives matter,” a response from the leaders of 13 United Methodist Church theology schools to the Jan. 15 letter above. Read a Dec. 17, 2014, story by Hannah Rubin writing in The Forward about ChanukahAction, a grassroots nationwide protest against police violence on the first night of Hanukkah. 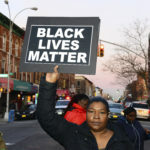 #Black Lives Matter describes itself not as an organization but as a social movement. Its website has served as a kind of clearinghouse for information about protests, meetings, rallies and other events relevant to civil rights for people of color. It was founded after the shooting death of Trayvon Martin in 2012 and has grown post-Ferguson. In October 2014, the site issued a “call to clergy” to preach about injustice and black lives from the pulpit. The site also maintain an active Facebook page. Contact via the website. ChanukahAction is a grass-roots organization of Jews formed in 2014 to protest against police violence in 15 U.S. cities. No single Jewish group is behind the organization. Jews for Racial & Economic Justice, an organization of New York City-based Jews and Jewish organizations, wrote a Black Lives Matter supplement to the Passover Haggadah. The Seminary Consortium for Urban Pastor Education is committed to further developing the ministries of urban pastors with a focus on justice, peace and inclusivity. It has routinely wound the issues raised by police violence into its courses and activities. The Rev. Shanta Premawardhana is president. The consortium is based in Chicago. Contact 312-736-1200. The Unitarian Universalist Church has compiled a list of Black Lives Matter worship resources. In June 2009, the Unitarian Universalist Association launched a campaign against hate crimes called “Standing on the Side of Love.” The campaign was a response to a July 27, 2008, attack on the Tennessee Valley Unitarian Universalist Church that killed two people and wounded seven. The gunman told authorities he was angered by the church’s acceptance of homosexuality and other liberal causes. After the shooting of Michael Brown in Ferguson, the group compiled a list of “Spiritual Reflections on Ferguson” for use in churches and worship services. Onleilove (pronounced “only love”) Alston is the executive director at Faith in New York, a coalition of 70 congregations in New York City. She is a social justice activist and an expert on black lives in the Bible. She recently participated in a panel sponsored by PICO National Network about the black church and the Black Lives Matter movement. Victor Anderson is Oberlin Theological School Professor of Ethics and Society at Vanderbilt Divinity School. He is also professor and director of the Program in African American and Diaspora Studies and Religious Studies in Vanderbilt’s College of Arts and Sciences. Anderson was ordained in the Christian Reformed Church. His areas of expertise include African-American political theology, 20th-century ethics, American pragmatism, religion and morality. Edward Phillip Antonio is associate professor of Christian theology and social theory, associate dean of diversities and director of the Justice & Peace Program at Iliff School of Theology in Denver. He wrote the article “Black Theology” in The Cambridge Companion to Liberation Theology. James H. Cone, Bill and Judith Moyers Distinguished Professor of Systematic Theology at Union Theological Seminary in New York, is the author of Risks of Faith: The Emergence of a Black Theology of Liberation, 1968-1998. He is widely considered to be one of the founders of black liberation theology, which frames Christianity as a means out of oppression. The Rev. Cyprian Davis is professor emeritus of church history at St. Meinrad School of Theology in St. Meinrad, Ind. He is a Benedictine monk and has expertise on African-American Christianity and on blacks and Catholicism. He can speak about African-American Catholics and theology as well as the history of African-American religion, especially in the civil rights movement. Kelly Brown Douglas is canon theologian at Washington National Cathedral and the author of Stand Your Ground: Black Bodies and the Justice of God. She is an expert on womanist theology and sexuality and the black church and is an Episcopal priest. She can discuss the #BlackLivesMatter movement and its influence on theology, especially in traditionally African-American churches. Leah Gunning Francis is associate dean for contextual education and assistant professor of Christian education at Eden Theological Seminary. She is based in St. Louis and was present in Ferguson, Mo., during the unrest in the aftermath of Michael Brown’s death. Eddie Glaude Jr. is a professor of religion and African-American studies at Princeton University in Princeton, N.J. He specializes in African-American religious history and is the editor of Is It Nation Time? Contemporary Essays on Black Power and Black Nationalism. Rabbi Michael Lerner is editor of Tikkun magazine and founder of the Tikkun Community, a peace and social justice movement. He is also a co-founder The Network of Spiritual Progressives. As chair of the Network of Spiritual Progressives, he wrote an essay for The Huffington Post on Dec. 10, 2014, encouraging all religious people to go to a black church in a show of solidarity. James Perkinson is professor of ethics and systematic theology at Ecumenical Theological Seminary in Detroit. He has written about religious expression in rap music. He is the author of White Theology: Outing Supremacy in Modernity and has written about race in connection with religion and urban culture. The Rev. Shanta Premawardhana is president of SCUPE, based in Chicago. Previously, he served as associate general secretary for interfaith relations at the National Council of Churches. The NCC represents Protestant, Anglican, Orthodox, historic African-American and Peace churches and engages in interfaith dialogue. He teaches a course on intercultural relations and has said it will begin to include aspects of police shootings and the Black Lives Matter movement. He has called for “a theology of deep solidarity” in the wake of Ferguson. Tamelyn Tucker-Worgs, associate professor of political science and African-American studies at Hood College in Frederick, Md., teaches African-American religions, the politics of the black church and black liberation theology. Theodore Walker Jr. is associate professor of ethics and society at the Perkins School of Theology at Southern Methodist University in Dallas. He wrote the book Empower the People: Social Ethics for the African-American Church, about African-American resources for a more inclusive liberation theology. West traveled to Ferguson for a protest and was arrested. Shannen Dee Williams is a writer and an assistant professor of United States and African-American history at the University of Tennessee at Knoxville. She has called for Catholic theologians to remember the lives of black women in the Black Lives Matter movement. ￼Jan Willis is a professor emerita of religion at Wesleyan University in Middletown, Conn. She is one of the earliest American scholar-practitioners of Tibetan Buddhism. Time named her one of six “spiritual innovators for the new millennium,” while Ebony called her one of its “Power 150” most influential African Americans. Some of her books include The Diamond Light: An Introduction to Tibetan Buddhist Meditation, On Knowing Reality: The Tattvartha Chapter of Asanga’s Bodhisattvabhumi and Enlightened Beings: Life Stories from the Ganden Oral Tradition. She is a self-described “Baptist-Buddhist” and has written about Buddhism and the Black Lives Matter movement. Four New York City rabbis were arrested in December 2014 for their participation in a social disobedience exercise in the wake of the death of Eric Garner. This press release names them and has contact info. Nyle Fort is a minister, writer and community organizer based in Newark, N.J. His areas of study include critical race theory, African-American studies, the American prison system and hip-hop culture. He has been published in the Harvard Journal of African American Public Policy, The Guardian, Black Girl Dangerous and The Feminist Wire. He has linked the Black Lives Matter movement to Christian theology. Yavilah McCoy is a teacher, writer, diversity consultant and performer. She has linked the Jewish holiday of Purim to the fight for justice for the African-American community and the Black Lives Matter movement. She founded Dimensions Educational Consulting in Newton, Mass. Rabbi Jesse Olitzky serves at Congregation Beth El in South Orange, N.J. He has written about the link between the death of Eric Garner and the Jewish obligation to speak out for social justice. The Rev. Ashlee Wiest-Laird is pastor at First Baptist JP in Jamaica Plain, Mass. She traveled to Ferguson, Mo., to protest and spoke about the experience on Boston Public Radio. Sandra Barnes is a professor of human and organizational development at Vanderbilt University in Nashville, Tenn., whose research interests include the sociology of religion. She is the author of The Black Mega Church: Framing and Addressing HIV/AIDS and Poverty in the Age of Health and Wealth Theology. J. Kameron Carter is an associate professor of systematic theology and black church studies at Duke Divinity School. He recently participated in a panel on Black Lives Matter hosted by the school. Sister Jamie T. Phelps is a professor of systematic theology and director of the Institute for Black Catholic Studies at Xavier University of Louisiana in New Orleans. She can discuss how the Black Lives Matter movement is playing out in New Orleans post-Katrina. Kenny Wiley is the director of faith formation at Prairie Unitarian Universalist Church in Parker, Colo. He graduated with a degree in political science from the University of Missouri and studied at Harvard Divinity School. Wiley has written about the need for a “Unitarian-Universalist Black Lives Matter Theology” on his blog. Contact through the church website.